Hits all the routine beats but is plenty entertaining, with Pacino rediscovering his enviable pizazz to headline a quality ensemble. Al Pacino brings all of his post-Scent Of A Woman baggage to the role of Danny Collins, a washed-up rocker who’s become a parody of his former self. And while seeing the little big man shimmy-shake on stage and croak behind a grand piano is frankly disturbing, there can be no doubt that Pacino understands what it is to feel debilitated as an artist; that he chooses to share those feelings is both courageous and, it seems, reinvigorating, for this is his best performance for longer than anyone would care to remember. Just like that, Danny ditches the tour, the drugs and the age-inappropriate relationship, instead checking in to the New Jersey Hilton to write new material and visit the estranged son (Bobby Cannavale, revelatory) he had with a groupie. 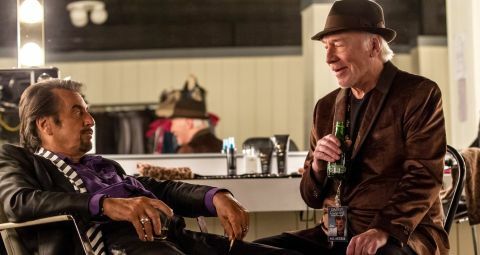 The directing debut of screenwriter Dan Fogelman (Last Vegas, Crazy, Stupid, Love), Danny Collins is a familiar redemption drama built upon a bassline of clichés but played with enough dexterity to cheer crowds. It’s hardly an interior turn from Pacino, who turns up the charisma for often comic effect, but there’s enough introspective quietude to render a largerthan- life star (be it Collins or Pacino) human, and there’s much to be said for bouncing off a terrific support cast that includes Jennifer Garner, Annette Bening and Christopher Plummer. Be warned, though: Danny’s signature anthem ‘Hey, Baby Doll’ is an unshakeable earworm. Bring earplugs for the gig scenes.